Some of you might remember Sara’s post from a few weeks ago where she did a video with Good Bite demonstrating her Creamy Chicken and Bacon Pastry Pockets. In addition to the Real Women of Philly series, we’ve been working with Good Bite on a series called Real Fast Food. Basically, it’s this fabulous concept that you can make something delicious at home quickly and with just a few ingredients. Let me tell you that I agonized about this project. Like everything else we put on the blog, I wanted it to be exceptionally delicious and I also wanted it to be something that just about anyone could make. I didn’t want to cut corners or sacrifice flavor, which is tough for me when I don’t even really consider garlic an ingredient anymore; it’s just kind of like salt and pepper or water. I’m telling you this story because I want you guys to know that I FULLY endorse this recipe. It is so good. I don’t feel like I had to sacrifice flavor to make it and it’s something I’m 100% proud to put on our blog. I also feel like it’s something fancy and bistro-ish–like something you could serve to your boss or your in-laws and they’d think you were a culinary genius. So the fact that you can make it in less than 15 minutes and that it has 5 ingredients (oil, salt, and pepper don’t count, before some smart aleck calls me out… 🙂 ) is just icing on the cake, right? Between the video and the instructions at the end, me telling you about the recipe might get a little repetitive, so let me just tell you a little about browning butter. This is something that’s really hard to describe because the biggest indicator of the butter being cooked correctly is its smell. And since smell-o-vision was a major flop, you’re just going to have to trust me here. Once you start cooking your butter, watch for it to turn light golden brown. Then get your nose down there and sniff it. The scent you’re looking (smelling?) for is quite distinct and smells a little like caramel. That paired with the golden color should tell you it’s ready. If it’s not brown enough, your pasta will just be buttery, which isn’t bad, per se, it’s just not what you’re after, you know? If you get it right, though, the brown butter adds an element of depth, a sweet, nutty, salty richness that’s unmistakable. Now…I’d love to answer your butter-browning questions but, if you caught our post from Monday, I am currently out of town (how can I be in two places at once?! Insert Twilight Zone music here). I may have a chance here and there to check my email, but I can’t make any promises. So if a few days go by and I haven’t responded to your questions, don’t be sad–I’ll write you back this weekend. Cook the ravioli according to package directions. While the pasta is cooking, heat about 1-2 tablespoons of olive oil in a large skillet over medium-high heat. 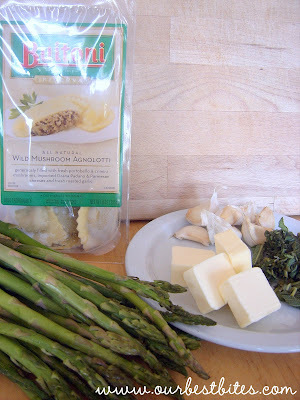 When the oil is hot, add the asparagus and cook until it is tender-crisp. Season the asparagus with salt and pepper to taste. Transfer the asparagus to a serving dish and place the dish in an oven set to 160 degrees. In a smaller skillet, cook the butter over medium heat, stirring frequently, until it becomes light brown and fragrant; it will start to smell like caramel. Add the chopped garlic and sage and cook, stirring constantly, until the garlic is tender and fragrant. Toss the cooked pasta with the brown butter sauce and season with salt and pepper. Serve immediately with the side of asparagus. Tip: To cut down on how many dishes you have to wash, you can wipe the larger skillet out with a paper towel after cooking the asparagus; just be careful not to burn the butter and garlic in the larger skillet. Ohhhh, I can't wait to try this! 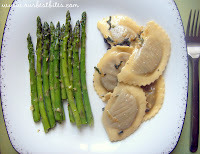 Every since I read Twilight I have had an unusually hankering for mushroom ravioli and brown butter sauce is the BEST! Thank you! This is basically all of my favorite things in one dish. Thanks! oOoooo this looks sooooo delicious!!!! i even have some ravioli in the fridge i can use! yay! thanks! Oh my gosh this looks delicious! I will have to make this one day when The Hubble isn't home because he doesn't like mushrooms. Thanks for sharing! Great job with your video! Wow! This really looks good and easy to make! I really like the fact that you did a video! Sure makes everything easier when you can see it! I'd love to see more videos! Thanks!